The new stunt by the YouStink movement is a great idea: naming different random dumps after members of a government that failed to solve the ongoing garbage crisis. But isn’t it somehow incomplete? Usually, politicians get a street, an avenue or a square named after them. 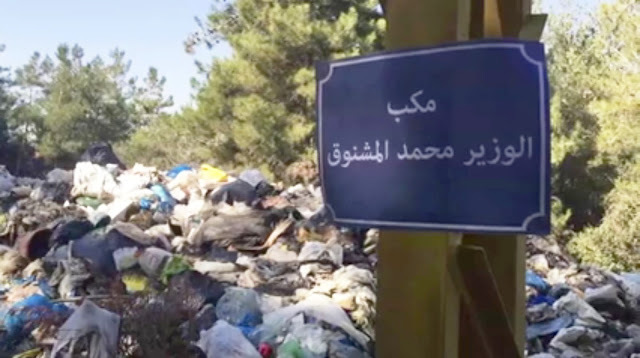 But today, after failing to solve Lebanon’s seven-month-old garbage crisis, we can all agree that no one in office today deserves such an honor. Instead, naming garbage dumps after those responsible for the country’s ordeal seems only fair. But why just members of government? Why not everyone actually responsible for creating this crisis and blocking its solutions? Why not those, politicians and activists alike, who rejected the Chehayeb plan, for example, and are partly responsible for the garbage still being out there, rotting everywhere? Why not the apathetic citizen who let this crisis go on and on? Aren’t they also responsible? Don’t they also deserve a dump named after them? Didn’t their silence and inaction encourage politicians to do nothing or so little? What about those who refused eco-friendly landfills under the outrageous pretext that they don’t want garbage produced by people from a different religious sect to be buried in their region? What about those who are looking to financially profit from this crisis? Knowing that most of them are not in the government. Why not name dumps after them too? YouStink usual slogan: ‘kellonn ya3né kellonn’ (everyone means everyone) had the unfortunate effect of eluding real responsibilities by diluting them in one big nameless whole called “everyone”. Now it’s the actual opposite: naming just a few people but not all responsible. In both cases, the effect is the same. So yes, the new stunt is a great idea, but for it to be complete, YouStink would be well inspired to continue naming garbage dumps. There are more than enough for everyone responsible, is there not? ٢٤ مكباً عشوائياً بأسماء وزراء "حكومة الزبالة"